Q: It is reported that the First Meeting of the Advisory Council of the Belt and Road Forum for International Cooperation was held in Beijing. Could you give us more details? A: Regarding this issue, the Foreign Ministry has issued relevant information, including the list of the members of the Advisory Council. I would like to say a few more words about this. First, the Advisory Council is a non-profit and international policy advisory body which is composed of international celebrities from all over the world, including former dignitaries, former heads of international organizations, prominent scholars and people from business communities. They join the Advisory Council in a personal capacity instead of representing any country or institution. Second, the establishment of the Advisory Council aims to widely solicit opinions and suggestions from all relevant parties with the principle of seeking shared benefits through extensive consultation and joint contribution so as to provide intelligence support for the Belt and Road Forum for International Cooperation. The whole process of its establishment is open, inclusive and transparent. We have picked the brains of all relevant parties and notified the foreign embassies in China of the relevant information. After getting the consent of all the Advisory Council members, we announced the name list. The operation model and the rules of procedure of the Advisory Council are decided by all its members through discussions. Third, the First Meeting of the Advisory Council is very successful. 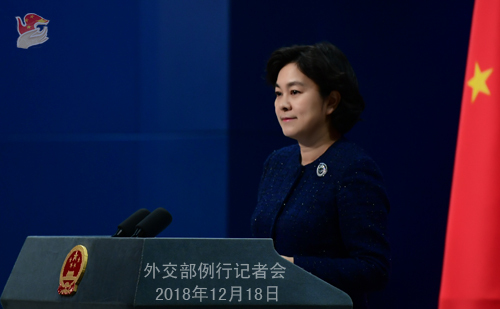 The members reviewed the progress in jointly advancing the Belt and Road Initiative and spoke highly of the positive role of this initiative in enhancing connectivity of different countries and regions, promoting world economic growth, building an open world economy and implementing the 2030 Agenda for Sustainable Development. All the members support deepening and substantiating the Belt and Road Initiative and hope that the second Belt and Road Forum for International Cooperation will send out the positive signal of championing multilateralism, openness, development and win-win outcomes. They have also put forth constructive suggestions and proposals on macro-policy coordination, the development of practical projects and cooperation guarantee mechanism. Q: The social media site Twitter said that it detected suspicious activities coming from IP addresses of Saudi Arabia and China. Do you have any comment? What the suspicious activities might be? A: I suppose what you mentioned is an earlier report by the Reuters. Yet this morning, the Reuters has corrected its previous erroneous report. The new report said that the IP addresses that are used to visit Twitter seem to come from China and Saudi Arabia, but they are probably not hackers working for the governments of relevant countries. As you know, the position of the Chinese government on cyber security is consistent. We hope that when it comes to this issue, all parties can follow the spirit of mutual respect, equality and mutual benefit to address this global issue through dialogue and cooperation. Q: We noted that the Chinese government issued a policy paper on the European Union (EU) this morning. 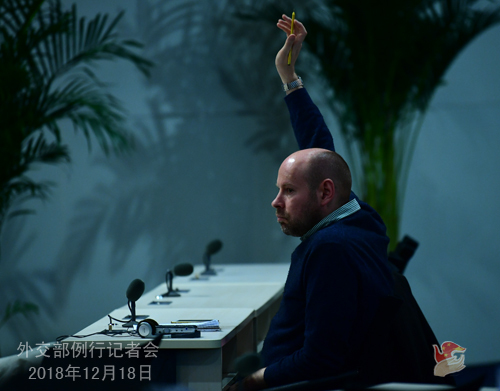 Is it of any special significance to the China-EU relations under the new circumstances? A: The Chinese government issued its third policy paper on the EU today, following the previous ones in 2003 and 2014 respectively. The policy paper is an important proclamation of China's policy on the EU, which elaborates the goals of China's policy on the EU in the new era and the important measures to strengthen the dialogue and cooperation in various areas between China and the EU going forward. The EU makes a vital strategic force in the international landscape. 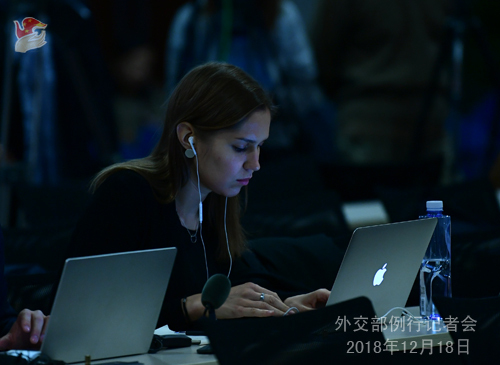 China values the EU's role and influence in the regional and international affairs, and developing the relationship with the EU has been among the priorities of China's diplomacy all along. In recent years, the building of the China-EU partnership for peace, growth, reform and civilization has continued to make new progress. The China-EU Comprehensive Strategic Partnership has continued to grow in both width and depth, forming a sound pattern of all-dimensional, multi-tiered and wide-ranging exchanges and cooperation. This year marks the 15th anniversary of the China-EU Comprehensive Strategic Partnership and the 20th anniversary of the China-EU Summit, when the China-EU relations face a new prospect and key opportunity for further development. The Chinese government hopes to deepen and broaden comprehensive cooperation with the EU, move forward the China-EU relations and jointly build the world peace, contribute to global development and uphold the international order. Q: On December 18, the Japanese government adopted the new National Defense Program Guidelines and the Medium-Term Defense Readiness Plan at a cabinet meeting, which stipulate that the defense budget will increase by about 10% in the next five years. The relevant documents include China-related contents and show strong concern to China's moves in the field of military security. What is your comment? A: The China-related contents in these documents released by the Japanese side are nothing but a string that's been harped on many times before. 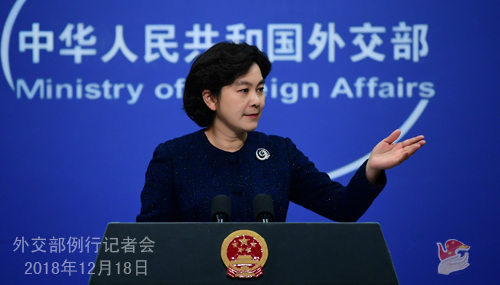 They are making irresponsible remarks and levying groundless accusations on China's normal national defense building and military activities and inciting the so-called "China threat" with Cold War mentality. Such move by the Japanese side is not conducive to the improvement and development of China-Japan ties or the peace and stability in the region. China is strongly dissatisfied with and opposed to that, and has lodged stern representations with the Japanese side. Due to what happened in history, Japan's moves on the military security front have been closely followed by its neighboring countries in Asia and the international community at large. We urge Japan to keep its commitment to the "purely defensive defense" strategy, stay committed to the path of peaceful development and act cautiously in the area of military security. Q: My question is similar to the previous one. The Japanese government today decided to transform a frigate of its Self-Defense Force into an actual aircraft carrier. What is your comment? A: Due to what happened in history, Japan's moves in the field of military security have been closely followed by its neighboring countries in Asia and the international community at large. We urge Japan to keep its commitment to the strategy of "purely defensive defense", adhere to the path of peaceful development and act cautiously in the area of military security. Q: According to reports, White House National Trade Council Director Peter Navarro said that the US wants China to buy more from the US through the trade talks, but much more importantly are the structural changes. What is your reaction? A: Regarding the issue of China-US trade talks, I would like to refer you to the Commerce Ministry for the specifics. What I can tell you is that the economic and trade teams of the both sides stay in close communication on the consultation in accordance with the spirit of the consensus reached by the two heads of state at their summit. We hope the teams from the two sides will faithfully implement the consensus reached at the meeting of the two heads of state, and step up consultations in a bid to remove all additional tariffs for mutually beneficial and win-win results under the precondition of mutual respect, equality, promise-keeping and matching words with deeds. Mr. Navarro said he wants China to conduct structural reforms, but I want to advise him and other relevant officials and persons that share similar ideas with him to conscientiously read the important speech delivered by General Secretary Xi Jinping at the gathering in celebration of the 40th anniversary of China's reform and opening up this morning. The Chinese civilization is brilliant, the only one that has continued for over 5000 years without interruption in the history of mankind. There is no textbook or golden rule to follow for reform and development in China, a country with over 5000 years of civilization and more than 1.3 billion people. No one is in the position to dictate to the Chinese people what should or should not be done. 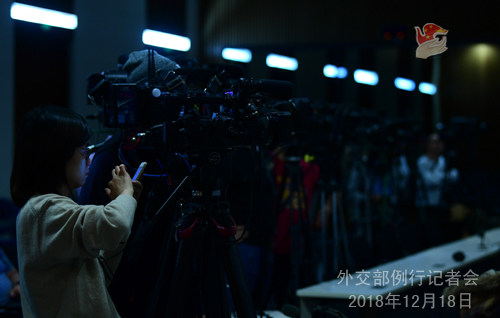 What to reform and how to go about the reform must be consistent with the overarching goal of improving and developing the system of Socialism with Chinese Characteristics and modernizing China's system and capacity for governance. We must resolutely reform what should and can be changed, and resolutely not reform what shouldn't and can't be changed.